All women have body hair, but it is usually very fine and light in color. The difference between normal body hair and unwanted excessive hair is mostly the texture of the hair and the area on which it grows. Excessive hair growth in women is a condition called hirsutism. The excessive hair that grows on a woman’s face, arms, back and chest is usually coarse. 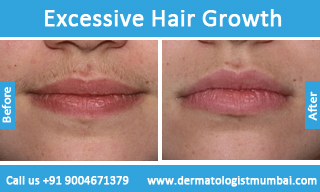 The hair growth that a woman goes through during hirsutism is equivalent to the hair growth in men. The cause of the hair growth is the production of extra amount of male hormone testosterone that usually is found in normal levels in every woman. Sometimes it may be a hereditary trait, due to medications or underlying malignancy. What are the common patient complaints of Excessive Hair Growth? Excessive hair in undesirable places usually affects a woman’s self-confidence and esthetic appeal. Many tend to find temporary solutions for the problem. However, a skilled skin specialist in mumbai can prescribe a treatment for more long-lasting effects. What are the temporary solutions? Bleaching or lightening of hair – This is will make the unwanted hair less visible, but they will still be noticeable. Shaving – If the blade is not good, it will leave your skin stubbly, leading to irritation and redness of the skin. Plus when the hair grows back, it will be thicker than the last time and there may be ingrowths. Plucking – can cause small scars on body, but are fairly safe if done by professionals. This method is however not really helpful in treating ‘excessive hair growth’. Waxing – The most common method of hair removal, it can be painful and there is risk of allergy, skin darkening, scarring or swelling. 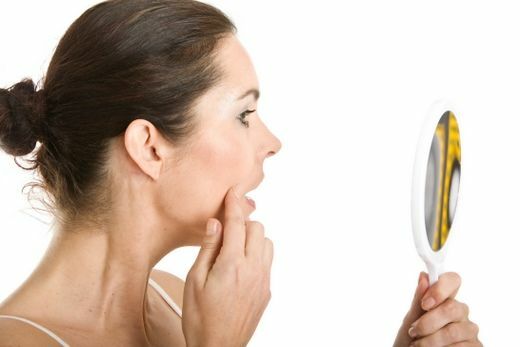 Chemical or electrolysis may be used, but these too have the risk of swelling and scaring and chemicals leave behind a bad odor as well. The Esthetic Clinics offers a permanent solution for unwanted hair growth. 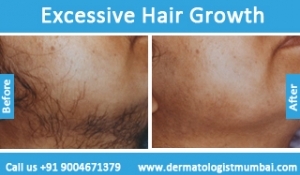 With our Excessive Hair Growth Removal in mumbai, the patient is provided a permanent relief from excessive hair growth. With our laser treatment an intense beam of light (laser) is targeted at the melanin pigment of the hair which is the cause of dark color of the hair. This treatment is especially for large targeted area and thick, dark hair. What are the types of Lasers used? The type of laser used is different as per the patient and their hair and skin colour. There are lasers such as the diode, Nd YAG, Ruby and alexandrite which have different levels of intensity of lights (laser) that are used for hair removal treatments. 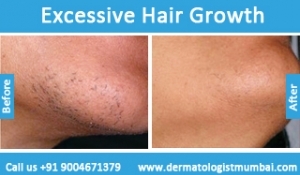 What is the Procedure of Excessive Hair Growth Removal ? 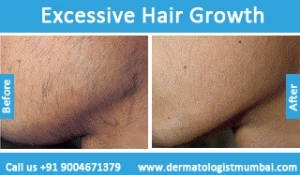 The procedure for hair growth removal starts with trimming of the hair (just a few millimeters) above the surface of the skin. Our laser equipment will be adjusted as per the requirement of color of the hair, thickness of hair, area where the hair needs to be removed and the color of your skin as well (as the laser targets melanin pigment, the intensity of the laser will be decided upon the color of the skin). That is why laser hair growth removal treatment works more for people with the combination of light skin and dark hair. You will be given an appropriate eye protection, depending upon the intensity of light. As it is important to protect the outer surface of your skin, a cool gel will be applied or a cooling device will be attached to the laser device. The cooling will help the light of the laser to penetrate your skin and prevent damage to the skin. You may experience a little discomfort, but after two to three appointments the hair growth will slow down. What are the Benefits of Laser Removal for Excessive Hair Growth? Removes selectively coarse and dark hair. Removes hair while leaving the skin undamaged. Procedure takes only little time and treats large amounts of hair at the same time. The reduction of hair with this laser treatment is permanent, ensuring that the hair does not grow again, provided underlying causative factors are treated and controlled. It can be undergone by men who do not want hair on certain areas of their body. What are some things to remember before undergoing this treatment? It usually takes around 8-12 sessions for results but it may take longer for those suffering from hormonal imbalance. There will have to be follow up sessions every 3 to 4 months and we shall ensure that the results are completely permanent. However, it is necessary that you complete the requisite number of sessions. 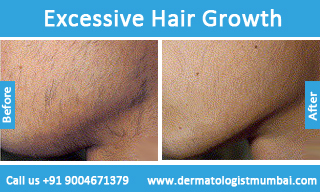 If the dose and the duration of laser is not appropriate, there can be paradoxical hair growth. The growth of hair reduces with each session and gradually becomes nonexistent. One will require maintenance sittings towards the end. We have exceptional facilities and custom designed services for each of our clients. Our machines are in keeping with the latest standards and we have world-class Best Dermatologists in Mumbai like Dr. Rinky Kapoor on board. 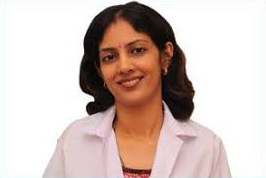 She is a leading name in the niches of cosmetic dermatology, skin and skin laser treatments. Book an appointment with her today.